How much money have you left on the table? and get anything you want! Get everything you want through power negotiating. Get the best deal possible — whether you're buying a new or used car, buying a new home or refinancing your current one, asking for a promotion or a raise, or negotiating the terms of a new position. Become more at ease in any negotiation situation. Recognize when certain ploys are being used against you and know how to counter them. Understand the basic forms of power and how they impact the negotiations. Discover the benchmarks of a win-win negotiation. Negotiation is a skill that brings you vast success in all aspects of your life. Are you a weak negotiator? Are you caught in a position where you feel cheated, undervalued? Do you wish you could make changes - but aren't sure how to make them? In this email, I'll show you how to begin making changes. 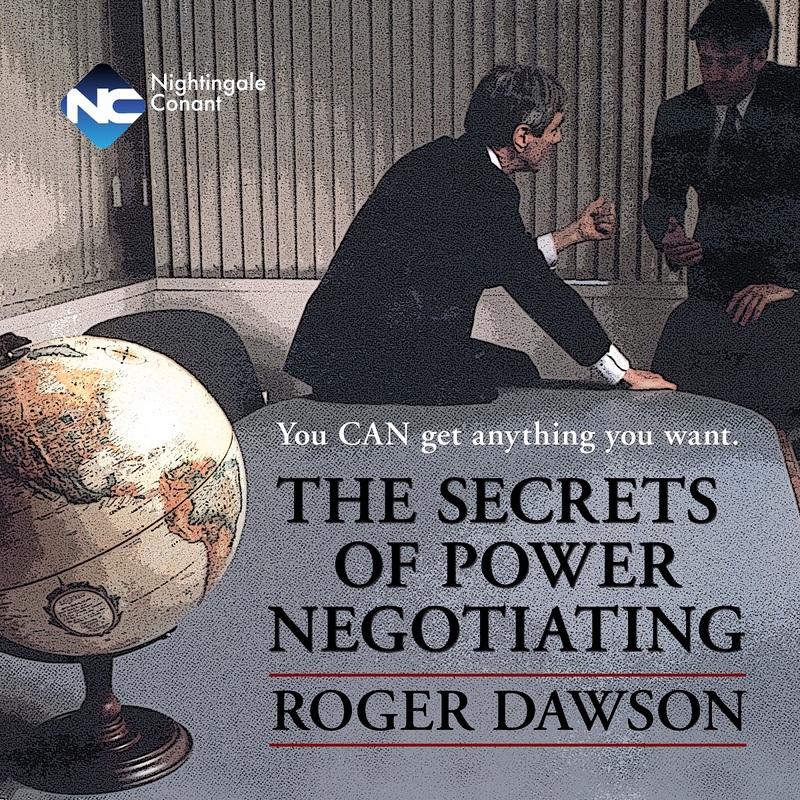 Roger Dawson, bestselling author of the books You Can Get Anything You Want, But You Have to Do More Than Ask and Power Negotiating, gives you the skills, tactics, strategies, gambits, and counter-gambits of Win-Win negotiating. Roger Dawson started his first company at the age of 16, and his varied business background includes being president of one of California's largest real estate companies. He's now an expert keynote speaker and corporate trainer on the topic of negotiation. “No” is just an opening position! Many novice negotiators get only a little of what they want, alienating their opponent in the process. Power negotiators, however, can create win-win situations. In these situations, both parties walk away feeling they're winners, satisfied with the outcome, and happy to deal with each other again. Negotiation is a form of art. It instills its possessor with a great power. And if you know how to do it correctly — if you know how to structure negotiations so that others get what they want and you get what you want — you will be a lot more successful in life. Not only that, but a great deal of the pressure, stress, and friction will be removed from your life. Never assume you know what the other party wants. Always get to know the person, rather than the business or the prospective deal. Understand that people are different and they have different perspectives on the negotiations. There are always hidden drivers behind people's actions — discover them. One, establish the criteria for both sides. Two, get information about the other side; you can never know too much. Three, reach a compromise. Negotiating is a two-way affair. Negotiating is always a two-way affair. Desire to acquire the skills of negotiating. Know how the different principles and gambits affect negotiating. Desire to create win-win situations. There are very specific gambits or tactics that are used in the negotiating process. A few of these may seem quite ruthless to you, but it is important that you are aware of them because others may attempt to use them against you. Even if you never feel comfortable using these tactics yourself, you must know how to defend against them. Here are just a few of the tactics you'll need to become a great negotiator. For every scenario there is a favorable tactic and a full set of counter-tactics. The tactics used throughout negotiations are dependent upon the findings of the first three stages and new information introduced throughout negotiations. Nibbling Gambit — Since directly after the initial agreement the opposition is most vulnerable, some things are more easily achieved later in a negotiation; introducing a demand early may mean it will be bargained out or traded off. Hot Potato — Someone wants to pass his or her problem to you. Higher Authority — Always have an unidentified entity behind you that had the authority to make a decision. Set-Aside Gambit — Put an issue on hold, find agreement on little issues to create momentum, then return to any major impasse issues. Mediator — Bring in a third party to mediate, someone who must be perceived as neutral. In any negotiation, one person is in control and one person is being controlled. Understanding the eight elements of power is essential in any negotiation. Knowing your personal power strengths and weaknesses as well as those of your opponent is the single most important factor in negotiations. Legitimate Power — Comes with a title or position. Reward Power — Perception that someone has the ability to reward you; they have power over you. Punishment Power — Perception that someone has the ability to punish, intimidate, or embarrass you; they have power over you. Reverent Power — Goes to anyone with a consistent set of values. Charismatic Power — Power based entirely on strength of personality. Expertise Power — When you project to people that you have a little more knowledge or expertise than they do in a particular area, you develop power over them. Situation Power — People who have very little latitude in the way they do their jobs; they have power over you. Information Power — Sharing information forms a bond, withholding information intimidates, and both of these give power. Along with power comes information and personality. The party with the most information usually controls negotiations. To become a great negotiator you must know how to get information and then once you have the information, you need to know what to do with it. For success in negotiating and in your personal relationships, it is critical that you understand your own personality style and the styles of those with whom you deal. More importantly, you must learn to adapt your skills, techniques, strategies, gambits, and counter-gambits to the different personality styles of people as they relate to your own style. Roger Dawson's, The Secrets of Power Negotiating teaches you how to prepare negotiations, determine appropriate tactics to use, identify counter-tactics to use, apply the eight elements of power, understand the effects of personality types and what negotiation styles to use with each type, interpret body language, and find the hidden meanings in conversations. With this and more, you're sure to become a great negotiator...And in this economy, how can you afford to be a weak negotiator? Analyze and adjust to the personality type of the person or people with whom you're dealing. Decipher your opponent's body language and conversational cues. Predict responses to your negotiating maneuvers. Recognize the elements that always affect the outcome of negotiations. Use information to increase your power dramatically. Confidently apply for bank loans or ask for more money. Use deal-closing tactics like walking away or playing dumb. I want to get everything I want by becoming a great negotiator! for the special price below. I can select one of two ways of ordering.